It’s All About The Numbers! When you hear the word “evangelism,” what comes to mind? A loud, obnoxious preacher screaming at people on the street corner? Going door to door in a neighborhood with little or no results? Mustering enough nerve to talk to someone about Jesus only to be rejected? In his book, It’s All About the Numbers, evangelist Riley Stephenson addresses these common misconceptions about evangelism and provides a refreshingly new approach to sharing your faith with very fruitful results! Have a passion for the lost! Love people in a greater way. Overcome any hurdles you have had in the past in witnessing to someone. See yourself as God sees you and be able to do what He has called you to do. Teach others how to win the lost. See countless numbers of people born into the Kingdom of GodIf your heart longs to see your family, co-workers, friends, acquaintances, and even strangers saved, then this book is your tool for effective, result-oriented evangelism! 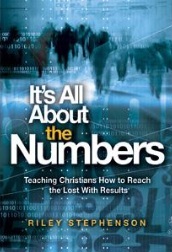 In it, you will see afresh, through Heaven’s eyes, that it really is all about the numbers! I believe every believer should get this book! Get yours click here!